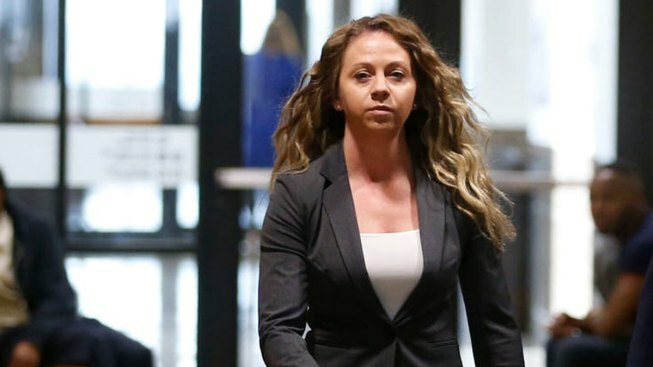 Former Dallas police Officer Amber Guyger walked the hallway after court date at the Frank Crowley Courts Building in Dallas on Monday, March 18. Guyger is charged with murder in the Sept. 6 shooting death of Botham Jean in his own apartment. The murder trial of former Dallas police officer Amber Guyger has been delayed six weeks due to the availability of one of her attorneys, court documents show. The trial was scheduled to begin Aug. 12, but a judge signed a request from Guyger's attorneys Tuesday that delayed the proceedings until Sept. 23. The court documents said one of Guyger's attorneys, Toby Shook, is the lead counsel in a federal jury trial that is scheduled to begin July 29 -- United States v. Humberto Novoa. That trial is expected to last two to three weeks, which the documents said would give not give Shook enough time to sufficiently prepare for Guyger's trial. Judge Tammy Kemp signed the documents, approving the defense attorneys' request. Shook was joined by attorney Robert Rogers on the form. Guyger is accused of fatally shooting Botham Jean inside his own apartment on Sept. 6, 2018. She was charged with manslaughter three days later, before a grand jury heard evidence and opted to indict Guyger on a murder charge. Because of the extensive coverage of this case, a judge issued a gag order on Jan. 8, noting that "as a result of statements made to, and published by, the press a serious and imminent threat to the constitutional right of the defendant herein to a fair trial exists."